A power rack is a great fitness tool for individuals looking to increase strength and power. Like any piece of home fitness equipment though, there are a ton of them on the market and it can be exhausting comparing all of them. I’m here to help you find the best home power rack so you can spend less time shopping and more time exercising. A power rack is basically a steel cage used for spotting you while you perform certain free weight exercises. Power racks also go by “power cage” and “squat rack”, although some lifters will tell you there’s a difference between power racks and squat racks. Personally, I’m not too concerned about differentiating between “cages” and “racks”, it’s all semantics. One thing is for certain though, if you have 4 posts, it’s definitely a power rack (or cage). So you have 4 vertical posts, and at least 2 horizontal bars used for supporting the barbell. Power racks are designed to be used with barbells and all of the classic power training moves barbells are commonly used for. Think squats, deadlifts, bench press, and shoulder press. These are exercises where it really comes in handy to have a spotter. Especially if you are really pushing yourself and trying to increase your strength. Unfortunately, a lot of us exercising at home are often exercising by ourselves. This is where the power rack comes in handy. The power rack functions as a spotter during these moves. You can adjust the safety bars to catch the barbell at different heights depending on the exercise you are working on. For example, if I am squatting, I would set the safety bars at a height high enough to catch the barbell before it crushed me in the event that I lost control of my weight. The same can be done with any barbell exercise you are performing. The great thing about power racks is that they often come with attachments to help provide a more comprehensive workout. Common extra features include pull up bars, dip stations, and lat pulldown systems. For a more technical explanation, check out Wikipedia. If you have ever been to a local gym, I know you have seen a power rack. That’s where you do squats. Home power racks work the same way, they just tend to be a little less heavy duty. This is fine for 99% of us. The 1% of folks that are out there putting 1000’s of pounds on barbells will need to upgrade to a commercial grade rack. Fitness Reality is a division of Paradigm Health & Wellness, Inc. based out of California. They have been in the fitness equipment game for about 10 years now and their mission is to produce high-quality products that work for both elite athletes and weekend warriors alike. They produce a little bit of everything, ranging from ellipticals and treadmills to power lifting racks. Their X-Class Olympic Power Cage is a beast. It’s designed with home use in mind, but it wouldn’t be a stretch to see this rack in light commercial use. This power rack is well priced and comes with several attachments that make it very difficult to beat. Actually, as the name of this article implies, I think the Fitness Reality X-Class Olympic Power Cage is the best home power rack in it’s price range. Now let me show you why. This rack can handle almost a ton of real weight. Your typical Olympic style barbell weighs 45 lb. This means you can put A LOT of plates on your barbell and rest assured the X-Class Power Cage is going to hold up. I’m not much of a power lifter, I know this is way more capacity than I would ever need. In order to safely handle 1,500 lb, this rack needs to be stable and well constructed. And it’s both. The frame is constructed out of 2″ x 3″ tubular steel bars. The quality of construction will make you feel secure during your workouts. After all, it’s hard to make serious gains if you are worried about your rack falling apart on you, or collapsing under the weight of the barbell. The X-Class Power Cage includes 2 11.5″ safety bars and 2 35.5″ dual mounted safety bars. 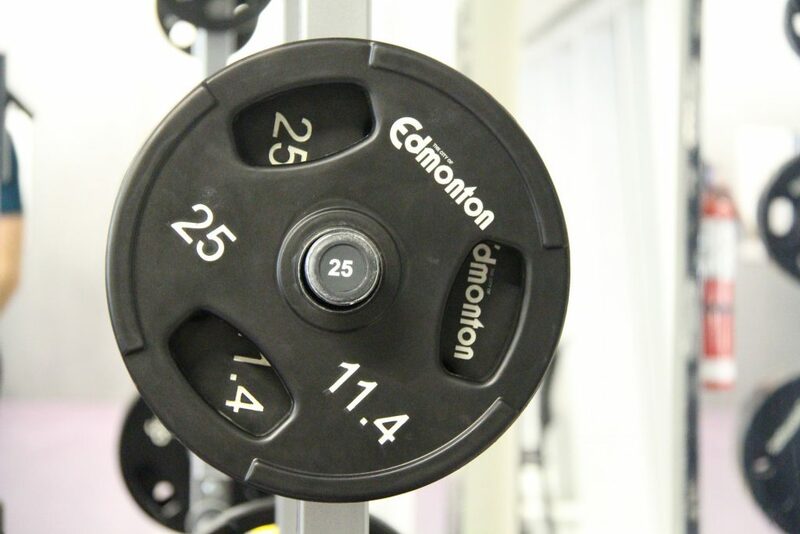 The shorter bars are great for holding the barbell for squats or bench press. I would set the longer dual mounted bars as my safety net to ensure the bar doesn’t hit the ground if dropped. Both are fully adjustable with 25 different heights available. This power rack includes 2 different pull up/chin bars with multiple grip options. Wide grip pull ups, chin ups, neutral grip pull ups, narrow grip, pull ups… all possible with these 2 included bars. These bars have a 600 lb weight capacity. This is a great indicator of how durable and well built this system is. The folks at Fitness Reality were nice enough to throw in a pair of adjustable dip handles too. These handles are covered with a high-density foam for added comfort and can also hold up to 600 lb. Dips are a great body weight exercise, but with such a high weight limit, you may want to try adding a plate or two to your dips. The X-Class Power Cage also comes with 2 J-hooks. These can be used to hold the barbell, much like the safety bars, but a lot smaller. These would work well for holding the barbell in a lower position. Perfect for doing exercises like bent-over rows, shoulder shrugs, or bicep curls. This power rack can be purchased as just the rack, or with the addition of a lat pull-down/rowing station. The addition of this pull-down station will cost you almost 200 extra bucks, but it will definitely expand the scope of your home gym. With this attachment, you get a dual-pulley system with a 40-in lat pull-down bar and a 20-in low row bar. The same plates you stack on your barbells can be used with this pulley system. It has a 360 lb weight capacity. The X-Class Power Cage really is designed for heavy lifters. All of these weight capacities are exceptionally high. I like that because it directly shows us how well built this product is. With the addition of the lat pull-down attachment, this power rack offers you the ability to perform at least 24 different exercises. I’m not going to list them all here, but I think that number may be a little low. There are just so many exercises you can do with a barbell. Then think of all the pull up variations you can do with the multi-grip handles. You can truly get a full body, world class workout with this rack. Users love how easy the instructions are to follow and how well labeled all the hardware is. You may dread putting something like this together just because of the size, but surprisingly assembly is pretty easy. I would suggest having a friend available to help though, because this rack is big and heavy. This power rack comes with a nice warranty: 10-year frame, 3-year parts, and 2-year wearable parts. Click here to see the X-Class power cage in action. There haven’t been many complaints from users about this product, but no product is perfect, not even the X-Class. Here are a few of the most common complaints users have. This rack is shipped in 4 different boxes (if you get the lat attachment). And those 4 boxes often arrive at different times. So, you may have to wait a bit for all boxes to arrive before you start assembling. With so many boxes, there’s more of a chance of damage during shipping. The X-Class Olympic Power Cage doesn’t offer pegs for plate storage when not in use. You would have to purchase a separate plate stand for storage if you so choose. For me, the huge weight capacities on every part of this rack is what sets the Fitness Reality X-Class Olympic Power Cage apart from the competition. When you look at other power racks in this price range, you see weight capacities that are literally half of what this beast can handle. This tells me that this product is well built. I also love the ability to add the lat pull-down attachment. It costs a little extra, but it adds extra variety to your workout. As do the multi-grip pull up handles and dip handles. If lifting weights is a big part of your workout, this power rack may be the only piece of equipment your home gym needs. The X-Class Olympic Power Cage is very popular and online user reviews are overwhelmingly positive. This power rack is currently rocking a 4.8/5 average user rating on Amazon. If you are looking for a serious home power rack that will be able to hold up to the most strenuous workouts, the Fitness Reality X-Class Olympic Power Cage is a safe bet. In this price range, it’s unbeatable. What Is A Spin Bike Anyway And Why Should I Care? What Is A Power Rack And Does My Home Gym Need One?